One of the oldest known constellations Taurus, also known as “The Bull”, houses many fascinating objects nestled in the darkness of our skies. 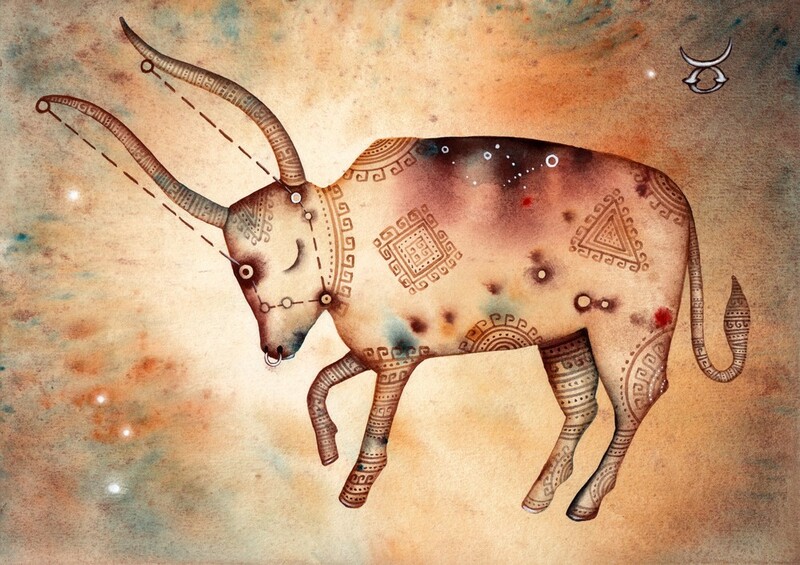 The constellation dates back to that of the Bronze Age and Babylonian Astronomers commonly referred to it as “The Heavenly Bull”. The Bull, embodied both Osiris and his sister Isis in the eyes of the Egyptians. The brother and sister were respectively represented as bull-god and cow-goddess. Acc ording to Greek myth, the passionate god Zeus was thought to have disguised himself as a bull in yet another of his love affairs.The exquisite Europa, daughter of King Agenor, was strolling along the sea shore with her companions at her side, when Zeus noticed her and instantly became completely infatuated. The clever god immediately disguised himself as a magnificent white bull and upon appearing amongst the group, none felt fear as his calm demeanour radiated brilliantly. Europa and her companions made fine-looking flower garlands to hang around the animals neck, and such were they trust in his composure that Europa climbed onto the animal’s back. 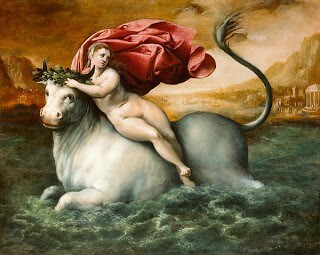 To their shock the bull hurried to the sea and feverishly swam away with the poor Europa terrified beyond belief. Upon their arrival in Crete, Zeus revealed his true identity to the girl. Here he ravished the woman who was to bear him three sons, the oldest of which was meant to bring the bull cult to Crete. Although Taurus is visible in both the Northern and Southern Hemisphere, it will appear to be upside down in the Southernparts during spring and summer. Cave paintings suggest that “The Bull” has been depicted by man for over 10 000 years. The brightest star in the constellation, called Aldebaran, shines 500 times brighter than the Sun! The constellation is probably best known for the Pleiades (Messier 45), also known as the Seven Sisters, and the Hyades, which are the two nearest open star clusters to Earth. In the Southern hemisphere, Taurus rises in the north-east and sets in the north-west, in December and January the constellation will first appear low on the horizon in the north east and continue westwards, before dipping below the horizon. From February to March it will appear in a more northerly or northwesterly direction. In addition to the Pleaides star cluster, neighbouring constellations can also help to easily find the bull of the heavens. These constellations include Aries, Cetus, Eridanus, Gemini, Perseus and Orion. Gilgamesh from Mesopotamia is sometimes associated with the nearby Orion, another ancient constellation, and the two constellations are depicted as Gilgamesh and the bull in combat. 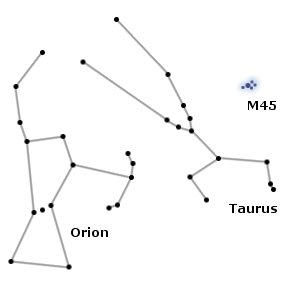 Next week we will take a closer look at the seven sisters of the bull, the infamous Pleaides/M45.